Las Fallas refer to artistic constructions made of paper, cardboard, wood, plaster and currently also with styrofoam. These figures are called “ninots” and usually represent satirical figures (teasing politicians or celebrities). An intense work of artists and artisans (carpenters and sculptors) who spend months to build these impressive figures that can measure more than 30 meters high. The word “falla” comes from the Latin “torch” and was used to name the torches that were placed in the watchtowers of the city. The popular explanation of this festival´s origin states that it was initiated because the carpenters on the eve of the day of its patron, San José, made a “purifying bonfire” in order to clean up their workshops before spring. 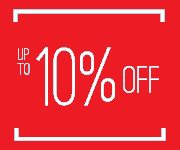 Within these celebrations there are many important music acts, fireworks and parades. One of the most important ones take place on 14 and 15 March at night, called “plantá“, which is when the Fallas monuments are established. The “mascletá” (a word that comes from firecracker) takes place every day at 14:00 from March 1st until March 19th at the Town Hall Square. It consists of the explosions of firecrackers reaching over 120 decibels. A true fireworks show that shakes the ground. And finally, the “cremá” (burning) which is the closing ceremony of the celebrations. 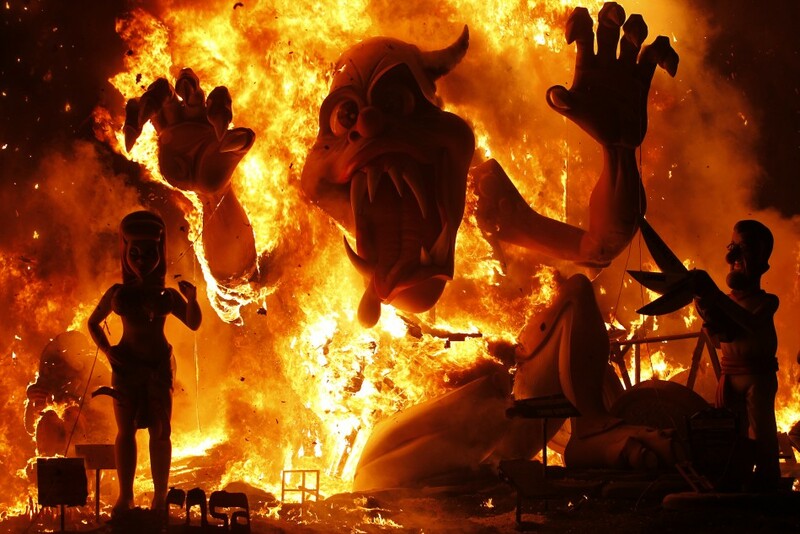 And it is the spectacular burning of all Fallas figures. Every year one “ninot” is reprieved from being burnt by popular vote and is late exhibited at the Museum of the Ninot along with the favorites from previous years. The night of June 24th is the night of San Juan, and is celebrated in many cities in Spain. A special celebrations take place in Valencia and Alicante. 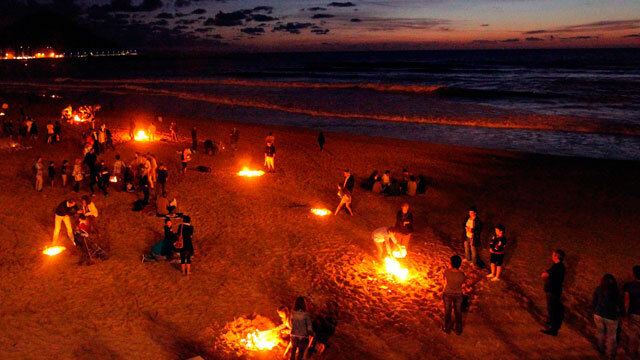 The beaches of the cities are filled with party and fire, people celebrating and jumping the waves. Here, as in the case of Las Fallas, the meaning of the fire is purification. It is a festival of Christian origin (6 months prior to the celebratation of the birth of Jesus), but not without a pagan influence due to the celebration of the summer solstice. The origin of this massive “battle” of tomatoes goes back to a youth fight that occurred in 1945. 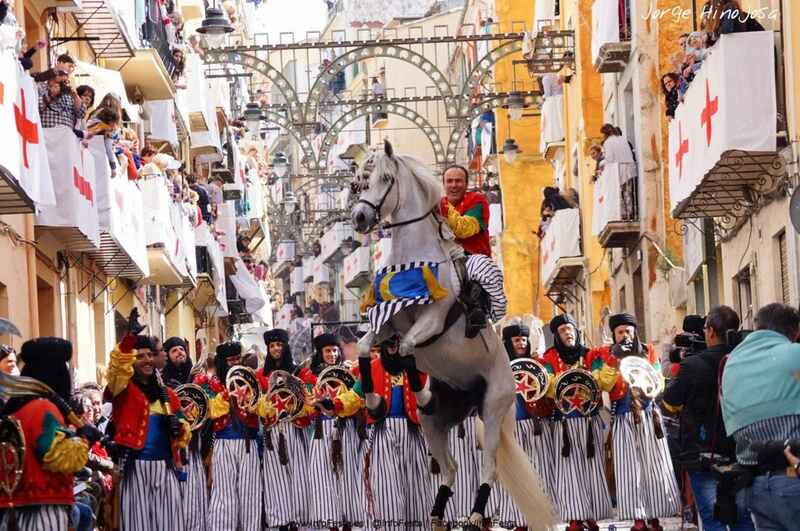 Since then it is held every year, the last Wednesday of August in the town of Buñol (Valencia). 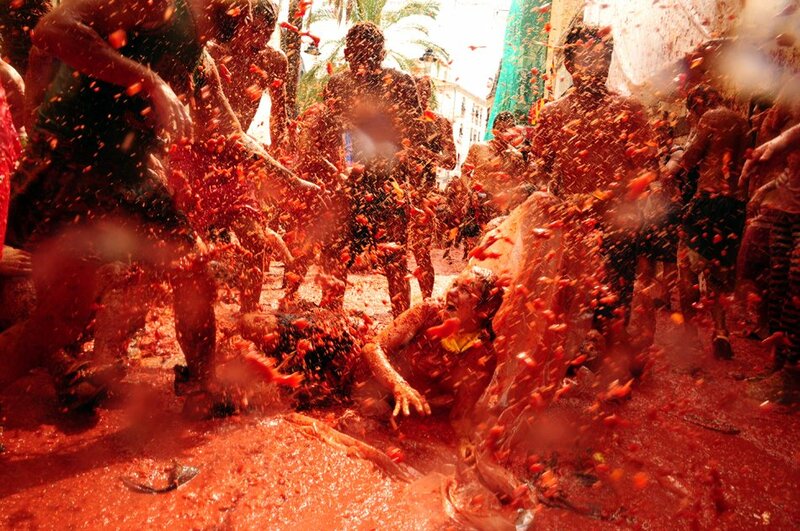 Crowds gather to throw tomatoes against each other and in few minutes everything becomes red. The goal is to simply have fun. If you decide to drop by, do not forget your goggles! Before the”battle” begins there is a tradition called “palo jabón,” long greased pole with a ham on the top. The aim is to climb up the pole and make the ham drop, which is tried by many, very often unsuccessfully to the joy of viewers. About 150 tons of tomatoes are distributed among the attendees. Currently there are around 22,000 people participating in the event. Tomatoes come from a nearby village and are grown specifically for this party. The Moors and Christians festival celebrations are held since the late sixteenth century. They commemorate clashes between Muslim and Christian troops that took place during the thirteenth century to gain control over the territory of Spain. 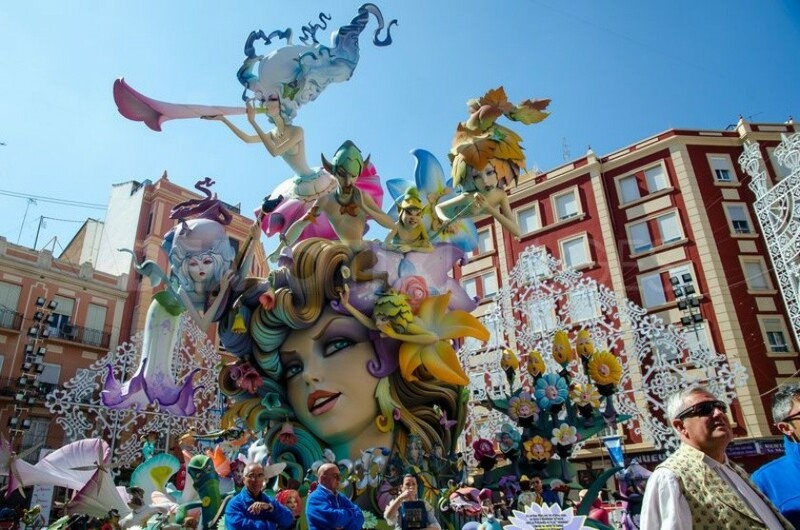 The celebrations are widespread along the Mediterranean coast, especially in Valencia and Alicante, and are usually held in August. Often they are performed in honor of the patron saint of the city in question. The feast recalls the period of Muslim sovereignty in the Iberian Peninsula and a popular theme represented during the festival are passages of the reconquest by the Christians of the Spanish territories. Each city has its own peculiarities but the most outstanding are the towns of Alcoy, Villajoyosa and Caravaca de la Cruz declared of National Tourist Interest. They gather up to 5,000 people taking part in the parade.